How do I decide which Chakra jewellery suits me best? What are the chakras? Visit our beautiful Chakras page, which takes you on a journey through each of the seven energy centres. We find that by understanding them better, one tends to feel drawn to the chakra or chakras which need balancing. Help Me Choose: If you are still unsure, head over here. By choosing the words and colours that resonate with you most, we’ll help narrow down the choices for you. You may feel drawn to wear more than one chakra at a time, or feel like wearing different pieces on different days. This is because we are dynamic beings, and as our energies shift and change so do our needs. For a holistic balancing of all seven chakras we recommend a multi-chakra piece, which incorporates them all. How will the jewellery affect me? Why not ask the people who’ve been wearing our jewellery? Visit here to know more about what people are saying. Of course, what is beautiful about the jewellery – and the philosophy behind it – is that it is centred around you. Everyone responds uniquely and so the benefits vary from individual to individual. All our jewellery is specially crafted with enamel and the highest grade of silver used in jewellery, known as 925 sterling silver. - Use a silver cleaning cloth or soft cloth to rub the silver jewellery after every use. - Avoid contact of silver jewellery with moisture, heat and liquids such as water, shampoo, soap, lotions etc. as they may damage the silver. - The enamel (the colour used in the jewellery) requires your care and attention especially whilst you wear it to prevent chipping. Can I buy this jewellery in my city? We are partnering with businesses across the world to make our jewellery widely available. Check here for a list of retailers that carry our collection. I love this jewellery – can we do business? Absolutely! We are expanding our global reach and are open to considering new business proposals. Please get in touch with us through our business enquiries page here. Our pieces are all hand-finished which give them a beautiful artisanal quality. As with all handmade products, this means there may be variations in size, colour and length from the images and information displayed on our website. Hang on a second, what are the chakras? Find out more about the chakras here. Where are the Chakras on my body? The seven Chakras are located along the cerebrospinal complex, beginning at the base of the spine and rising upwards towards the crown of the head. Click here to see more clearly what this looks like. So…who came up with the Chakras? This system of the chakras was codified in ancient Indian scriptures. However, these energies are not unique to one civilisation. Renderings and literature of other cultures also reveal the extensive knowledge of the bodymind’s energies to these civilisations. Still curious? Check out our Sangha Universe page here for articles, videos, podcasts and more on the chakras. Once your order has shipped, you will receive a confirmation email with the tracking number for your shipment. Follow the link to track and trace your order via one of our 3 shippers: FedEx, DHL, or the Post Office. You can expect to receive your order within 1-3 weeks from the date of purchase. What happens if I am not home when the courier delivers my order? If you are not available to collect your order after the courier’s first delivery attempt, they will leave a note at the delivery address instructing you to contact their local office to arrange a re-delivery. I have entered the wrong information during checkout, what should I do? Call or email us to provide the correct information as soon as possible. We will do our best to accommodate any changes provided your order has not yet been processed. Yes we do. In fact, we ship to most destinations, as we endeavour to accommodate all customers regardless of where they are. Please visit our Shipping, Duties and Taxes tab here for an estimate of your shipping costs. Certainly. Sign in to your user space on chakrabypiya.com, select ‘My Orders’ on the left pane, and you will be able to view your order history. We accept all major credit and debit cards including Visa, Mastercard and American Express. You will see ‘Chakra by Piya’ on the transaction description of your credit card statement. At Piya, we take your credit card data security very seriously. For that reason, we use secure socket layer (SSL) technology to ensure all data transferred remains private. In addition, we have enlisted a Validated Level 1 PC1 DSS Compliant Service Provider to ensure your credit card information is always handled securely. You can learn more about their security practices here. How do you handle duties and taxes? What will these be? Please visit our Shipping, Duties and Taxes tab here for details of our duties and taxes policy. Please visit our Returns tab here for a details of our returns policy. Feel free to check our Size Guide here. How can I submit my feedback to Chakra by Piya? We always love to hear your experience with our jewellery. Head over to the Sangha Universe page here and share with us your experience. Where can I read what people feel about the jewellery? Check out the Sangha Universe page here to see what other people are saying. Where can I change my login details, password and address? Log in to your account with your existing details, and select “Account Information” from the left menu pane. If you find that your questions are not answered here, feel free to contact us here. 1. Measure your wrist with a flexible tape measure or a strip of paper placed just below the wrist bone (or where you would normally wear the bracelet). 2. If you are using a plain strip of paper, mark your size with a pen or pencil. Then use a ruler to measure the length. That would be your wrist size. 3. To find your bracelet size, just add your wrist size with the appropriate measurements below. 4. We generally recommend sizing according to a comfort fit, to allow your wrist some room to breathe. Firm fits are appropriate for lobster clasp bracelets and cord bracelets only. At present, we make rings in sizes 6, 7, 8 and 9 according to United States sizing standards. For clients with a ring size up or down, we recommend having it resized locally. 1. 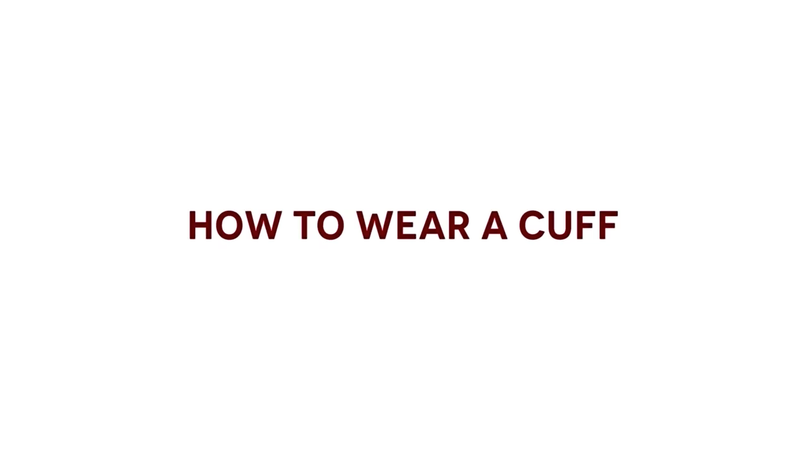 Many people wear our cuffs further up the forearm than they do our bracelets, given that they are ¾” wide. Using a flexible tape measure or strip of paper, measure your wrist or forearm at the position you’d like to wear the cuff. 2. If you are using a plain strip of paper, mark your size with a pen or pencil then use a ruler to measure the length. 3. Our cuffs are adjustable and come in two size ranges; choose the size range that your measurement falls in to. Our goal is to keep our prices as reasonable as possible. Therefore, we charge you the applicable shipping fees in addition to your order. Since our jewellery falls into light weight shipping categories, the shipping fee is usually only dependent on destination. Use the shipping calculator below to get an estimate on how much it will cost to ship to you. Import duties, taxes and fees are not included in the price of the item or in the shipping cost. Such charges are the buyer’s responsibility. Please contact your local customs authority for further details. If for some reason you are not happy with your order, you can return the item(s) within 7 days of receipt. Just be sure that the jewellery hasn’t been damaged and is returned in its original packaging to ensure we receive it in good condition, along with the appropriate paperwork. All returns must be shipped via a trackable courier service (FedEx, DHL or registered post). Please note that you are responsible for the jewellery and the transportation fees from your country until it reaches us at our office in Hong Kong. Once your return is approved, the cost of the item will be refunded back to the original credit card used to make the purchase. Please allow 30 days from the time your return reaches us to process the return and credit you with the funds. At this time, we do not offer exchanges. Any new products can be purchased via a new order. If you find that your item was damaged upon arrival, please contact us here immediately, and within 7 days of receipt. Some companies include the cost of return shipments in their prices. In an effort to keep our costs low, we have chosen not to do so. This way, the pricing is fair to all our customers. 1.1 Please read the terms and conditions (the “Terms of Service”) set forth below as they apply to your access and use of our services, including but not limited to our various websites, APIs, email notifications, mobile applications, applications, buttons, and widgets and/or purchasing a Product from us (each a “Service” and collectively “Services”), and any information, text, graphics, photos, or other materials uploaded, downloaded, or appearing on the Services (collectively referred to as “Content”). Your access to and use of the Services signifies your acceptance of these Terms of Service and agreement to be bound by them and any and all other applicable terms referenced herein absolutely. The Services are provided and operated by Saama Limited (we or “Chakra by Piya”). We are a limited liability company registered in Hong Kong with our head office at 19/Fl., Siu Ying Building, 153 Queen's Road Central, Hong Kong. 6.3 You are also responsible for ensuring that all persons who access our Services through your internet connection are aware of these Terms of Service and other applicable terms and conditions and that they comply with them. 7.1 The information set out in these Terms of Service and any of the Services do not constitute an offer for sale but rather an invitation to treat. All orders submitted by you through our site shall be deemed to be an offer made by you to purchase the selected Products set out in your order upon these Terms of Service (an “Order”). No binding agreement for us to sell you any Product is made until we accept an Order in accordance with these Terms of Service. 7.2 To submit an Order you will be required to follow the online shopping process described on the site. After submitting an Order, you will receive an order confirmation (the “Order Confirmation”) that will act as an acknowledgement of your Order. 7.3 Processing of payment of an Order shall not in itself constitute acceptance of the Order by Chakra by Piya. Where an Order is refused or cancelled by Chakra by Piya, we will reverse or refund any payment already made for such Order in accordance with our prevailing refund policy at such time. 7.4 An Order is only considered accepted by Chakra by Piya upon the Order being shipped to the address provided by you. 8.1 Whilst Chakra by Piya makes best efforts to provide you with accurate and up-to-date images, details, descriptions, prices, and promotional information, there may be instances where errors and differences may occur. We cannot guarantee that your electronic display of any Product colour or image will be accurate. Chakra by Piya shall not be liable for any errors or differences in the images, details, descriptions, prices, and promotional information listed through our Services. 8,2 Chakra by Piya is under no obligation to fulfil an Order if the price listed on our website is incorrect (even after an Order Confirmation has been sent by us). If we discover an error in the price of any Products which you have ordered, we will inform you and give you the option of reconfirming your Order for such Product at the correct price or cancelling it. By confirming your Order for such Product, you authorise us to charge the additional amounts to you. If we are unable to contact you, we will treat the Order for such Product as cancelled. If you cancel your Order for such Product, we will refund payment in accordance with our prevailing refund policy at such time. 8.3 Where applicable, prices are inclusive of tax and are in Hong Kong Dollars. 8.4 Where applicable, delivery fees will be charged in addition to the price of the Product. Such charges will be displayed and included in the final total when you submit your Order. Major credit cards, including Visa, MasterCard, and American Express. 8.6 By placing your Order, you authorise us to transmit information to or obtain information about you from third parties from time to time and this may include requesting pre-authorisation on your card to ensure there are sufficient funds available to complete the transaction, authentication of your identity, validation checks on your credit card by the issuer, protection against fraud and to enable delivery of your Order. By placing your Order, you are confirming that the card belongs to you or that you are the legitimate holder of the Promotional Voucher, and have sufficient funds or credit facilities to cover the cost of the Order. 9.1 Chakra by Piya may from time to time run promotions, contests, or other privilege programmes (a “Programme”) that are subject to additional terms and conditions which are hereby incorporated by reference into these Terms of Service and can be found on our site at such applicable time. 9.2 Chakra by Piya may from time to time make available vouchers, codes, coupons, credits, or gift vouchers (a “Promotional Voucher”). A Promotional Voucher may be subject to additional terms and conditions which are hereby incorporated by reference into these Terms of Service and can be found either on the Promotional Voucher or on our site at such applicable time. 9.3 Each Programme and Promotional Voucher is valid for the time period specified by Chakra by Piya. 9.4 Each Promotional Voucher is only eligible for single use and cannot be used in conjunction with any other Programme or Promotional Voucher unless otherwise stated or explicitly agreed to by Chakra by Piya. will be declared null and void by Chakra by Piya where, in our sole discretion, such Promotional Voucher is suspected to have been used in breach of these Terms of Service. 9.6 Chakra by Piya's decision on all matters relating to each Programme or Promotional Voucher is final and binding. 9.7 Chakra by Piya reserves the right to discontinue any Programme or Promotional Voucher programme at any time, in our sole discretion, without notice or liability. 10.1 Chakra by Piya reserves the right to withdraw any Products from sale on the site at any time. Whilst Chakra by Piya will make best efforts to process all Orders, there may be exceptional circumstances where we need to refuse to process an Order after an Order Confirmation has been sent by us, which we reserve the right to do at our sole discretion. 10.2 If we refuse or cancel your Order for any reason and you have already made payment for your Order, we will refund payment in accordance with our prevailing refund policy at such time. 11.2 We will aim to deliver the Product to you at the place of delivery specified in your Order within 1 to 3 weeks from confirmation of your Order. 11.3 We will make best efforts to deliver the Products at the proposed delivery time but cannot and do not guarantee that delivery times will be met and, to the extent permitted by law, Chakra by Piya shall not be liable to you or any third party for any losses, liabilities, costs, damages, charges, or expenses arising out of late delivery. 11.4 Your signature may be required to accept delivery. If you are not available to sign for the Product upon an attempt of delivery, we may leave a card with instructions and terms, hereby incorporated by reference, for either re-delivery or collection. 11.5 There may be locations that we are unable to deliver to, in which case we will inform you using the contact details provided by you when submitting your Order and arrange for an alternative delivery method or cancellation of your Order. If you are not entirely satisfied with any of the Products you receive, you may return the Product to us within seven (7) days of receipt for refund. The returned Product must be un-used, in original packaging, unassembled, and with original tags attached (where applicable) and accompanied by proof of purchase. Chakra by Piya may at our sole discretion inspect the returned Product to ensure it complies with these requirements of return. From time to time our site may specify certain Products that this policy does not apply to and are not able to be returned. Where Chakra by Piya determines that a refund is to be made under these Terms of Service, payment will be reversed or refunded via the same method that payment was originally made. In the event a reversal cannot be done, we will contact you via the contact details provided when you submit your order to determine an agreed refund method. Chakra by Piya gives you a personal, worldwide, royalty-free, non-assignable, and non-exclusive licence to use the software that is provided to you by us as part of the Services. This licence is for the sole purpose of enabling you to use and enjoy the benefit of the Services as provided by Chakra by Piya in the manner permitted by these Terms of Service. 15.1 All intellectual property rights subsisting in respect of the Services belong to Chakra by Piya or have been lawfully licensed to Chakra by Piya for use in connection with the Services. All rights under applicable laws are hereby reserved. You agree not to upload, post, publish, reproduce, transmit, or distribute in any way any component of the website itself, the Content, or any access to any Service, or create derivative works with respect thereto, except with the prior written consent of Chakra by Piya or unless expressly permitted in these Terms of Service. The website, Content, and Services are copyrighted under applicable laws. 15.2 You agree that we are free to use, disclose, adopt, and modify all and any ideas, concepts, knowhow, proposals, suggestions, comments, and other communications and information provided by you to us (the “Feedback”) in connection with the Services and/or your use of the Services without any payment to you. You hereby waive and agree to waive all and any rights and claims for any consideration, fees, royalties, charges, and/or other payments in relation to our use, disclosure, adoption, and/or modification of any or all of your Feedback. 16.1 You retain your rights to any Content you submit, post, or display on or through the Services. By submitting, posting, or displaying Content on or through the Services, you grant us a worldwide, non-exclusive, royalty-free licence (with the right to sublicense) to use, copy, reproduce, process, adapt, modify, publish, transmit, display, and distribute such Content in any and all media or distribution methods (now known or later developed). 16.2 You agree that this licence includes the right for us to provide, promote, and improve the Services and to make Content submitted to or through the Services available to other companies, organisations, or individuals who partner with Chakra by Piya for the syndication, broadcast, distribution, or publication of such Content on other media and services, subject to our terms and conditions for such Content use. 16.3 Such additional uses by Chakra by Piya or other companies, organisations, or individuals who partner with Chakra by Piya may be made with no compensation paid to you with respect to the Content that you submit, post, transmit, or otherwise make available through the Services. 16.4 We may modify or adapt your Content in order to transmit, display, or distribute it over computer networks and in various media and/or make changes to your Content as are necessary to conform and adapt that Content to any requirements or limitations of any networks, devices, services, or media. 16.5 You are responsible for your use of the Services, for any Content you provide, and for any consequences thereof, including the use of your Content by other users and our third-party partners. You understand that your Content may be syndicated, broadcast, distributed, or published by our partners and, if you do not have the right to submit Content for such use, it may subject you to liability. Chakra by Piya will not be responsible or liable for any use of your Content by Chakra by Piya in accordance with these Terms. You represent and warrant that you have all the rights, power, and authority necessary to grant the rights granted herein to any Content that you submit. Please read this section carefully since it limits the liability of Chakra by Piya and its parents, subsidiaries, affiliates, related companies, officers, directors, employees, agents, representatives, partners, and licensors (collectively, the “Chakra by Piya Entities”). Each of the subsections below only applies up to the maximum extent permitted under applicable law. Some jurisdictions do not allow the disclaimer of implied warranties or the limitation of liability in contracts and, as a result, the contents of this section may not apply to you. Nothing in this section is intended to limit any rights you may have which may not be lawfully limited. All Information is for your general reference only. We do not accept any responsibility whatsoever in respect of such information. 17.1 YOUR ACCESS TO AND USE OF OUR SERVICES IS AT YOUR SOLE RISK AND IS PROVIDED "AS IS", "AS AVAILABLE." THE SERVICES ARE FOR YOUR PERSONAL USE ONLY AND THE Chakra by Piya ENTITIES MAKE NO REPRESENTATION OR WARRANTY OF ANY KIND, EXPRESS OR IMPLIED, INCLUDING, WITHOUT LIMITATION, ANY WARRANTIES ON MERCHANTABILITY OR FITNESS FOR ANY PARTICULAR PURPOSE OR NON-INFRINGEMENT. 17.2 WHERE THE BUYER IS DEALING AS A CONSUMER (AS DEFINED IN THE SALE OF GOODS ORDINANCE (CAP 26) SECTION 2A AND/OR THE CONTROL OF EXEMPTION CLAUSES ORDINANCE (CAP 71) SECTION 4), ALL OTHER WARRANTIES, CONDITIONS, OR TERMS RELATING TO FITNESS FOR PURPOSE, QUALITY, OR CONDITION OF THE GOODS, WHETHER EXPRESS OR IMPLIED BY STATUTE OR COMMON LAW OR OTHERWISE, ARE EXCLUDED TO THE FULLEST EXTENT PERMITTED BY LAW. 17.3 THE ENTIRE LIABILITY OF THE Chakra by Piya ENTITIES AND YOUR EXCLUSIVE REMEDY WITH RESPECT TO THE PRODUCTS AND/OR SERVICES OR OTHERWISE, IS RE-PERFORMANCE OF DEFECTIVE SERVICES. IN JURISDICTIONS WHICH DO NOT ALLOW THE EXCLUSION OR LIMITATION OF CERTAIN TYPES OF LIABILITY, OUR LIABILITY WILL BE LIMITED TO THE MAXIMUM EXTENT PERMITTED BY LAW. WE DO NOT ENDORSE, WARRANT, OR GUARANTEE ANY MATERIAL, PRODUCT, OR SERVICE OFFERED THROUGH US OR OUR SERVICES. WE ARE NOT AND WILL NOT BE A PARTY TO ANY TRANSACTION BETWEEN YOU AND ANY THIRD PARTY. 17.6 Without limiting the generality of the foregoing, in no event will the Chakra by Piya Entities be liable to you or any other person for any direct, indirect, incidental, special, punitive, or consequential loss or damages, including any loss of business or profit, arising out of any use, or inability to use, the information or the Products and/or Services, even if any of the Chakra by Piya Entities has been advised of the possibility of such loss or damages. 17.7 You will exercise and rely solely on your own skill and judgment in your use and interpretation of the information and use of the Products and/or Services. You are responsible to ensure that your use of the information, Products, and/or Services complies with all applicable legal requirements. 17.8 Without prejudice to the foregoing, if your use of the Products and/or Services does not proceed satisfactorily and/or where applicable you do not receive appropriate responses to such use from us, as set out in these Terms of Service or otherwise, you are advised to contact us at info@chakrabypiya.com. No such lack of response shall be deemed to constitute any acquiescence or waiver. 17.9 You hereby indemnify Chakra by Piya against all liabilities, costs, expenses, damages, and losses (including any direct, indirect, or consequential losses, loss of profit, loss of reputation, and all interest, penalties, and legal and other professional costs and expenses) suffered or incurred by Chakra by Piya in connection with any claim made against Chakra by Piya for actual or alleged infringement of a third party's intellectual property rights arising out of or in connection with your use of the Products and/or Services. This clause shall survive termination of the Terms of Service. 17.10 The limitation of liability contained in these Terms of Service will apply to the fullest extent permitted by applicable laws. 18.1 All Content, whether publicly posted or privately transmitted, is the sole responsibility of the person who originated such Content. 18.2 You warrant that any such contribution does comply with those standards, and you will be liable to us and indemnify us for any breach of that warranty and you will be responsible for any loss or damage we suffer as a result of your breach of warranty. 18.3 Any content you upload to our site will be considered non-confidential and non-proprietary, and we have the right to use, copy, distribute, and disclose to third parties any such content for any purpose. We also have the right to disclose your identity to any third party who is claiming that any content posted or uploaded by you to our site constitutes a violation of their intellectual property rights or of their right to privacy. We will not be responsible, or liable to any third party, for the content or accuracy of any content posted by you or any other user of our site. 18.4 The views expressed by other users on our site do not represent our views or values. We do maintain the right to remove any posting you make on our site if, in our opinion, your post does not comply with our content standards. We do not endorse, support, represent, or guarantee the completeness, truthfulness, accuracy, or reliability of any Content or communications posted via the Services or endorse any opinions expressed via the Services. You understand that by using the Services, you may be exposed to Content that might be offensive, harmful, inaccurate, or otherwise inappropriate, or, in some cases, postings that have been mislabelled or are otherwise deceptive. Under no circumstances will we be liable in any way for any Content, including, but not limited to, any errors or omissions in any Content or any loss or damage of any kind incurred as a result of the use of any Content posted, emailed, transmitted, or otherwise made available via the Services or broadcast elsewhere. 18.5 We may not monitor or control the Content posted via the Services and we cannot take responsibility for such Content. Any use or reliance on any Content or materials posted via the Services or obtained by you through the Services is at your own risk. 19.1 Chakra by Piya respects the intellectual property rights of others and expects users of the Services to do the same. We will respond to notices of alleged copyright infringement that comply with applicable law and are properly provided to us. If you believe that your Content has been copied in a way that constitutes copyright infringement, please provide us with the following information: (i) a physical or electronic signature of the copyright owner or a person authorised to act on their behalf; (ii) identification of the copyrighted work claimed to have been infringed; (iii) identification of the material that is claimed to be infringing or to be the subject of infringing activity and that is to be removed or access to which is to be disabled, and information reasonably sufficient to permit us to locate the material; (iv) your contact information, including your address, your telephone number, and an email address; (v) a statement by you that you have a good faith belief that use of the material in the manner complained of is not authorised by the copyright owner, its agent, or the law; and (vi) a statement that the information in the notification is accurate and that you are authorised to act on behalf of the copyright owner. 19.2 We reserve the right to remove Content alleged to be infringing without prior notice, at our sole discretion, and without liability to you. In appropriate circumstances, we will also terminate a user's Account if the user is determined to be a repeat infringer. Our address for notice of alleged copyright infringement appearing on the Services is 19/Fl., Siu Ying Building, 153 Queen's Road Central, Hong Kong. 20.1 We reserve the right at all times (but will not have an obligation) to remove or refuse to distribute any Content on the Services, to refuse any Order, to merge, suspend or terminate Accounts, and to reclaim usernames without liability to you. We also reserve the right to access, read, preserve, and disclose any information as we reasonably believe is necessary to (i) satisfy any applicable law, regulation, legal process, or governmental request, (ii) enforce the Terms of Service, including investigation of potential violations hereof, (iii) detect, prevent, or otherwise address fraud, security, or technical issues, (iv) respond to user support requests, or (v) protect the rights, property, or safety of Chakra by Piya, its users, and the public. 20.2 We do not guarantee that our Services will be secure or free from bugs or viruses. You are responsible for configuring your information technology, computer programmes, and platform in order to access our site. You should use your own virus protection software. 20.3 You may not do any of the following while accessing or using the Services: (i) access, tamper with, or use non-public areas of the Services, Chakra by Piya's computer systems, or the technical delivery systems of Chakra by Piya's providers; (ii) probe, scan, or test the vulnerability of any system or network or breach or circumvent any security or authentication measures; (iii) access or search or attempt to access or search the Services by any means (automated or otherwise) other than through our currently available, published interfaces that are provided by us (and only pursuant to those terms and conditions), (scraping the Services without our prior consent is expressly prohibited); (iv) forge any TCP/IP packet header or any part of the header information in any email or posting, or in any way use the Services to send altered, deceptive, or false source-identifying information; or (v) interfere with, or disrupt, (or attempt to do so), the access of any user, host, or network, including, without limitation, sending a virus, trojan, worm, logic bomb, or other material which is malicious or technologically harmful, overloading, flooding, spamming, mail-bombing the Services, or scripting the creation of Content in such a manner as to interfere with or create an undue burden on the Services. 20.4 We will report any such breach to the relevant law enforcement authorities and we will co-operate with those authorities by disclosing your identity to them. In the event of such a breach, your right to use our Services will cease immediately. 22.1 The links from the Services may take you to other sites or services and you acknowledge and agree that Chakra by Piya has no responsibility for the accuracy or availability of any Information provided by third parties' services and websites. 22.2 The Services may include advertisements, which may be targeted to the Content or information on the Services, queries made through the Services, or other information. The types and extent of advertising by Chakra by Piya on the Services are subject to change. In consideration for us granting you access to and use of the Services, you agree that Chakra by Piya and its third-party providers and partners may place such advertising on the Services or in connection with the display of Content or information from the Services whether submitted by you or others. 22.3 Links to other websites and services do not constitute an endorsement by us of such websites or services, or the Information, products, advertising, or other materials available made available by such third parties. You agree to defend, indemnify, and hold us harmless from and against all liabilities, damages, claims, actions, costs, and expenses (including without limitation legal fees), in connection with or arising from your breach of any of these Terms of Service and/or your use of the website. We may, if necessary, participate in the defence of any claim or action and any negotiations for settlement. No settlement which may adversely affect our rights or obligations shall be made without our prior written approval. We reserve the right, at our own expense and on notice to you, to assume exclusive defence and control of any claim or action. If there are two or more persons adhering to these Terms of Service as user, their liability under the Terms of Service is joint and several and their rights are joint. 27.1 The Terms of Service will continue to apply until terminated by either you or us as follows. 27.2 You may end your agreement with us at any time for any reason by discontinuing your use of the Services. You do not need to specifically inform us when you stop using the Services. 27.3 We may cease providing you with all or part of the Services at any time for any reason, including, but not limited to, if we reasonably believe: (i) you have violated these Terms of Service or (ii) you create risk or possible legal exposure for us; or (iii) our provision of the Services to you is no longer commercially viable. We will make reasonable efforts to notify you by the email address associated with your account or the next time you attempt to access your account. 27.4 In all such cases, any provision of these Terms of Service that expressly or by implication is intended to come into or continue in force on or after termination of this agreement shall remain in full force and effect. 27.5 Nothing in this section shall affect our rights to change, limit, or stop the provision of the Services without prior notice, as provided above in Clause 5 Changes to our services. 28.1 No party shall be in breach of these Terms of Service nor liable for delay in performing, or failure to perform, any of its obligations under these Terms of Service if such delay or failure result from events, circumstances, or causes beyond its reasonable control. In such circumstances, the affected party shall be entitled to a reasonable extension of the time for performing such obligations. 28.2 The affected party shall use all reasonable endeavours to mitigate the effect of a force majeure event on the performance of its obligations. 28.3 A force majeure event shall include such events as an act of God, fire, flood, typhoon, storm, war, riot, civil unrest, act of terrorism, strikes, industrial disputes, outbreak of epidemic or pandemic illness, failure of utility service or transportation, request from a government, or interference from civil or military authorities. In case of discrepancies between the English version and any other language versions of these Terms of Service and contents of this site, the English version shall prevail. Saama Limited is committed to protecting and respecting your privacy. This policy, together with our Terms & Conditions (www.chakrabypiya.com/customer-care#terms) and any other documents referred to in it, sets out the basis on which any personal data we collect from you, or that you provide to us, will be processed by us. Please read the following carefully to understand our views and practices regarding your personal data and how we will treat it. 8.5 In the event that a User wishes to access or amend his or her personal information and data, the Company may request him or her to provide personal details in order to verify and confirm his or her identity. A HKID card number or passport number or business registration certificate number cannot be amended unless such data is proved to be inaccurate. The Company is required to respond to a User’s request within forty (40) working days of his or her request and will endeavor to do so wherever possible.